Wood on Words: Don't Be "That Guy"
I've seen a few things very recently that are definitely on the "don't" list for authors. I thought I'd share a few along with some discussion. It's not the fault of other professionals that you didn't set aside money to do what you need to do in terms of preparing your book for publication. A "publishing professional" would know that people like editors, cover artists, book designers get paid for their services when those services are provided. 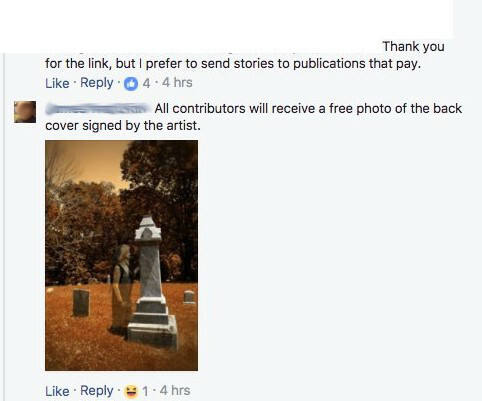 Exposure won't pay anyone's rent or mortgage, especially from work done for a beginning author who clearly has no clue. Presumably, the author intends to charge for his book and earn money from his writing. Why shouldn't the others involved in the process expect the same? Don't waste time trying to talk people into splitting future proceeds for your book which is going to be Yuge! (I mean, huge.) It makes you look foolish. The choice to indie publish is a risk, but it's a risk you choose to take. Others are under no obligation to take that risk with you. Just because someone is foolish enough to work for free doesn't mean everyone else should, too. This author is very lucky the editor chose not to share his name. The internet never forgets. If your budget is tight, start right away setting aside change, looking for corners to cut, or opportunities to make a little extra money. Once again, we have the issue of someone looking to get something for nothing, but there's another problem here: the "trust" issue. Some authors are paranoid about people stealing their amazing book or idea, so much so that they include threats of lawsuits in cover letters to potential agents, editors, and other industry professionals. If someone is dishonest enough to steal your work, a threatening paragraph won't deter them . The only thing you'll accomplish is making yourself look like someone with whom no others would like to work. Don't start at the bottom with "For the Love" or "Token Payment" markets. There's no harm in starting with markets that actually pay. Worst case, you get rejected. It's not the end of the world. If you don't think your work is good enough for anything better than a publication that pays in photos of the back cover, then maybe don't put it out there. Perhaps you can come back to it later, after you've honed your skills, and improve it. You won't build an audience by appearing in these sorts of publications. Professional editors don't care that you've been published in this sort of market. Readers definitely don't care that you've been published in some collection of which they've never heard. Don't flog your one book over and over to the same group of people. A few months back I joined a group dedicated to a specific subgenre. This group welcomes self-promotion, but I didn't do that right away. I noticed that this group is heavy with authors, which isn't exactly fertile ground for book sales, but I thought I might make some connections. I liked and replied to some posts, shared things I thought would be of interest, shared freebies or sales of books (other than mine) that I thought would be of interest to the group. It was a long time before I shared anything of my own, and I've only made two self-promo posts in the entire time I've been a member. Let's contrast that with another group member. We'll call him "Bob." Bob's cover isn't terrible, but it definitely isn't good. Bob's product description literally tells us nothing about the plot. The first paragraph is a discussion of the classic niche into which this book fits. The second paragraph gives a sketch of the main character. It concludes with a ine from the author, praising his own work. I'm not even kidding. The book itself has some issues. The formatting of the ebook is messed up. The writing is okay, but with beginner mistakes front and center. Despite these issues, Bob's book is terribly overpriced. Bob's book is, unsurprisingly, ranked in the millions. He hasn't sold a copy in months. How does Bob promote his book? By coming almost every single day to this small group, a group heavy with writers, and posting a link to this same damn book, always citing (in all caps) some Amazon customer review. Bob, if no one in this book has bought your book yet (and they obviously haven't based on your ranking) they're not going to. If you feel you positively must flog your book to other authors (not a great idea) make sure they've at least opted into your mailing list. This is the story of a well-known, bestselling, traditionally-published author. We'll call her "Jane." Jane recently got an awesome book deal from her publisher. (Awesome for Jane! I mean that.) Apparently feeling the pressure of the healthy advance she received, Jane decided it would be a good idea to create a newsletter and add all of her professional contacts to it without their consent. Because Jane has long been an officer in a professional authors organization, she had loads of contacts with whom she had corresponded.. As you can expect, things got ugly when Jane spammed everyone in her professional network prior to the book's release. When Jane created her newsletter, her particular provider required that she check a box saying that all her contacts opted in to her newsletter, and were not being added without their consent. Jane lied. Jane's newsletter service provider apparently gave her the boot for violation of Terms of Service, because on release day, Jane spammed us all again using a different newsletter provider. Setting the spam issue aside, there were other flaws in Jane's plan. Jane made no effort to make her newsletter engaging or attractive, or to even have an obvious "buy button." Instead, she wrote a lengthy letter (several paragraphs) with a hyperlink buried in the middle. Jane used the wrong strategy with her fellow authors. We generally know our genres and know who we like. We aren't going to respond to a sales pitch from our colleagues. What we might do, if we have a good relationship, is help you spread the word. If you don't mistreat us. Jane could have reached out personally, preferably individually, to people within her professional network and asked for help. That would have been a lot more work, but it probably would have been more effective, and Jane would not have a reputation as a clueless spammer. Those are just a few incidents from recent weeks. I'll do a "Stupid Author Tricks" episode some time in the future. Feel free to share things you've seen that are on the "Don't do" list.